Where can I purchase parts for the ’67 Beetle? Feel free to email. 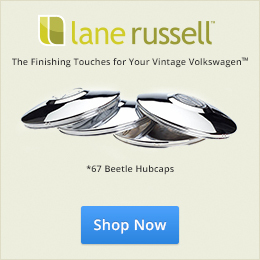 Also, we’re (Lane Russell) are a small business dedicated only the highest quality products available — including OEM, German, and NOS, with a focus on unique accessories. Can you tell me about the one-year-only parts for the ’67 beetle? Sure. You can read about them here. I’ll update this as time goes on. I’m looking for a ’67 oil bath air cleaner. Can you help? Sure can! We restore them. This is a very detailed process that I’m very proud of. Do you have any photos of a 100% stock ’67 Beetle? TheSamba has a great collection of photos of stock ’67 Beetles. “New Old Stock.” It refers to an item being brand new and newly discovered old stock rather than a reproduction. It’s old stock because it has been sitting in someone’s warehouse for many years, but it is nonetheless brand new. Why did you start 1967beetle.com? As some may know, I own my grandfather’s L620 Savannah Beige ’67 Volkswagen Beetle. I’ve worked as a visual designer / art director for the last 11 years. Over the last 8 +, I’ve been working on the ’67. During that time, I fell in love with creating real tangible objects and working with my hands. I’m obsessed with small details and the idea of bringing something old back to its former glory. This site is a reflection of my dedication to this great hobby. Who else makes 1967beetle.com possible? Many fantastic people around the world help make it happen. My wife Amanda Shoemaker of Decatur, GA helps with photography and programming. Timm Eubanks of Encinitas, CA is a contributing photographer and content provider. Jay Salser of Texas has owned many ’67 Beetles and is a contributing Sr. writer. This site takes a lot of time to run and maintain. We love every moment of it. I have a ’67 too, and I need restoration help. Can I hire you? I’m open to hear about your project needs! Feel free to reach out. Do you offer advertising placement on 1967beetle.com? Yes. Please take a look at the information.